Es "Scratching" Coconut Oranges .You must have been very familiar with that one drink is. 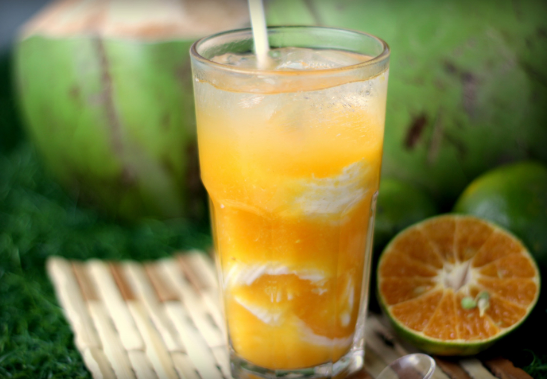 Yes, young coconut ice is a drink that can be regarded as "drinks must" have in places to eat, ranging from roadside stalls to expensive restaurants in five star hotels. Coconut ice is one of the drinks menu is very easy to find. Drinks coconut ice does have many advantages. In addition to its freshness, this drink also turned out to contain many benefits for the body, you know. Efficacy coconut whom are able diuretic and cleanse the urinary tract. In addition, young coconut also has anti-bacterial and anti-virus, and can kill microbes in the body. Young coconuts can also help healthy digestion, for existing content in young coconuts can kill intestinal worms and also neutralize toxins. Coconuts are a source of natural electrolytes that can prevent dehydration. Nutrients contained in coconut ie calcium, chloride, potassium, magnesium, sodium, and riboflavin. Coconuts also you can easily mix with other fruits, one of which is orange. Fresh citrus flavor and sweet fit perfectly together with coconut water rather tasteless. Let us just try the following recipe. You must have been very familiar with that one drink is. Yes, young coconut ice is a drink that can be regarded as "drinks must" have in places to eat, ranging from roadside stalls to expensive restaurants in five star hotels. Coconut ice is one of the drinks menu is very easy to find. 0 Komentar Untuk "Es "Scratching" Coconut Oranges"